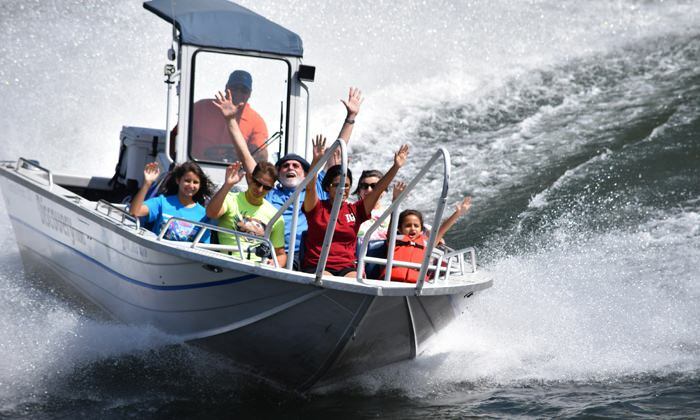 Adventure and thrills await at every corner of the river on a Rogue Jet Boat Adventures tour — when you're not also having fun learning the history of the region. The majestic Table Rocks are easy to spot from the Rogue River; being there at sunset just makes the view even better. At the base of Oregon’s Table Rocks rushes the explosive and bountiful Rogue River. 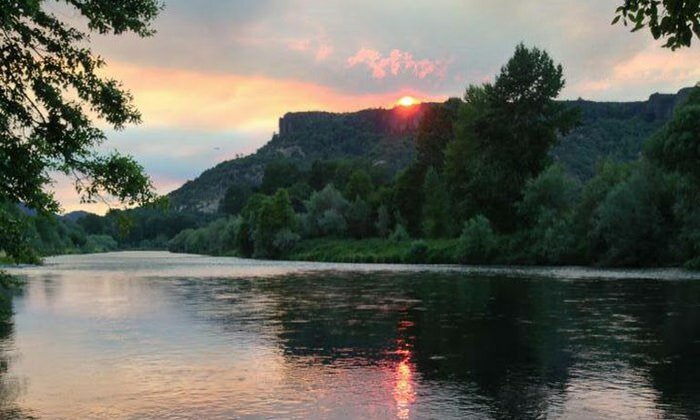 Known for abundant salmon runs, gripping whitewater rafting adventures and engaging historic treasures, this part of Southern Oregon is a must-stop for families, historians and adventurers alike. Once inhabited by the Takelma Indians, this region is not just rich in flora and fauna, it is also home to some of Oregon’s most captivating indigenous history and culture, from the 1853 signing of the ‘Treaty with the Rogue River” to the Rogue River Wars. One of the best ways to explore this area and its stories is by joining one of the Rogue Jet Boat Adventures river tours. 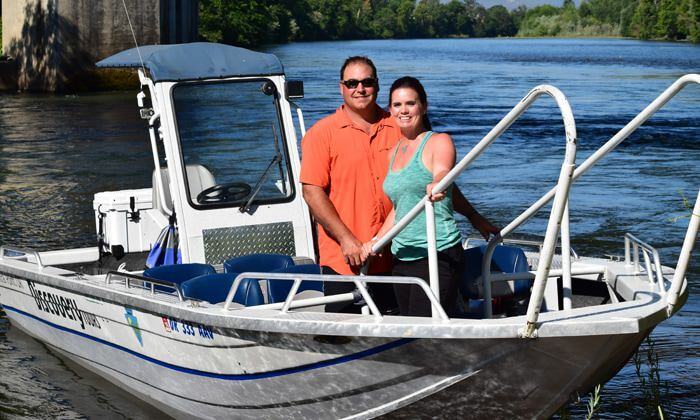 Taylor and Emily Grimes started Rogue Jet Boat Adventures in 2011. With Taylor at the helm of the boats and Emily managing PR and marketing, this duo proudly claims to run “Oregon’s #1 cultural and historical attraction.” From May through September, Taylor takes visitors and locals out on the river every day to have an Oregonian adventure while learning about the history and environmental makeup of the region. Because the land and its history are important to the Grimes’ business values and the legacy they want to leave behind, they signed up to participate in the Travel Oregon Forever Fund. The Travel Oregon Forever Fund gives people the opportunity to give back to the places they love to explore. Funds raised through visitors and businesses, like Rogue Jet Boat Adventures, go towards supporting projects throughout Oregon’s seven regions that support community and environmental needs. The neighboring Table Rocks volcanic plateaus were selected as a beneficiary project in 2014-15 to help develop new interpretation signs and guides for visitors. The Grimeses value education above all else as part of their business. By educating their guests about the local environment and history, like the neighboring Table Rocks, they create greater awareness around sustainable ways to recreate. The two hope to watch those ideas spread as guests take home what they learned on their trip. After a morning of rapid adventures on the Rogue, a little R&R seems appropriate. The Grimeses suggest filling your bellies post-Jet Adventure at one of their favorite local haunts, like Rogue Creamery or the Point Pub and Grill (ask for the blue cheese garlic fries). Or if more history is what you seek, head 10 minutes down Route 238 to the historic gold rush town of Jacksonville where you can learn more about the region’s rich and tumultuous past.